MaxiCalc Pro v1.5: 12 languages! 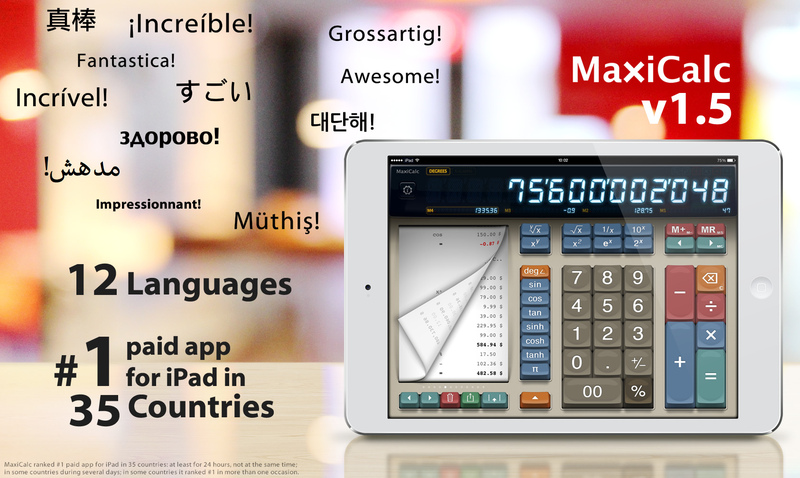 MaxiCalc v1.5 now supports 12 languages! We can’t believe we came so far, in less than a year! In the past three months we’ve seen MaxiCalc frequently reaching top #100 in many countries. in 35 of them MaxiCalc made #1 overall paid iPad app! Big countries and small countries: thousands of people are using MaxiCalc around the world, most of them don’t speak any of the few languages we were offering. So, besides the existing 5 languages, English, French, German, Portuguese and Spanish, MaxiCalc is now also translated to: Arabic, Japanese, Italian, Korean, Russian, Turkish and Chinese. In total, we worked with 29 translators – we are so grateful for their care and attention. Anyway, there can always be something wrong: if you notice something weird or that could be more natural in your language, we ask you to use the built-in support option inside MaxiCalc: tell us! We really appreciate! There are still many languages yet to be included in the future. But lets just stop for a minute and contemplate what we accomplished together… isn’t it nice? Thank you all for helping us! MaxiCalc now supports 12 languages! This entry was posted in Blog on March 1, 2014 by Everson Siqueira.